(CNN) -- James Anderson and Graham Onions took all nine Australian wickets to fall on the second day as England took command of the third Test at Edgbaston. 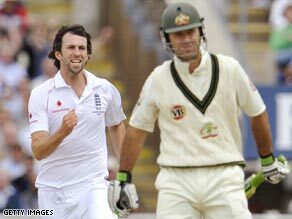 Onions is delighted after sending back Australian captain Ricky Ponting for 38. Australia, who resumed overnight on a healthy 126 for one wickets, collapsed in the face of an onslaught from the pace pair, being dismissed for 263 shortly after lunch. England were 116-2 when bad light brought play to a premature end. Durham paceman Onions set the mood with wickets from the first two balls of the day, trapping Shane Watson leg before wicket for 62 and then bowling Mike Hussey for a duck to continue his miserable run of form. Ricky Ponting reached a landmark early in the session as he went past the 25 runs he needed to surpass Allan Border as Australia's leading run-scorer in Test cricket. It moved him into third place in the all-time list behind Sachin Tendulkar and Brian Lara, but on 38 he became the third victim of the morning for Onions as he mishooked a bouncer through to wicket-keeper Matt Prior. That left Australia in deep trouble on 168 for four wickets but worse was to follow as Anderson got into the act with the ball swinging extravagantly. He had Marcus North caught behind for 12 by Prior and trapped vice-captain Michael Clarke leg before with another swinging delivery. Mitchell Johnson went first ball, again leg before wicket for a duck to leave Anderson on a hat-trick, but debutant wicketkeeper Graham Manou survived. Manou, a late replacement for the injured Brad Haddin, made eight before he misjudged an Anderson delivery to be bowled in the final over of the morning to end a sorry session for the tourists on 203 for eight. Late resistance by Nathan Hauritz, Peter Siddle and Ben Hilfenhaus saw 60 added for the final two wickets, shared by Anderson and Onions. England quickly lost Alastair Cook to Siddle and Hilfenhaus had Ravi Bopara play on for 23. But recalled Ian Bell and in-form captain Andrew Strauss (64 not out) made sure they did not lose any further wickets with an unbroken stand of 55. England, who lead the five-match series 1-0, are bidding to win back the Ashes from Australia.